John started playing guitar at the age of thirteen. After exploring many different musical styles he immersed himself in the study of Jazz guitar under the mentorship of Jazz guitarist Alvin Dyers. The guitar and saxophone duo is the most popular option. The saxophonist "doubles" on clarinet and occasionally, flute.Vocals, bass or drums can be added, creating a full band.Top musicians such as Willie van Zyl and Dan Shout feature in the group on a regular basis. John has performed with some of South Africa's finest musicians such as Willie van Zyl, Errol Dyers, Basil Moses, Lionel Beukes, the late Nick le Roux, Kevin Gibson, Darryl Andrews, and the Cape Town Jazz Orchestra. John is a highly experienced, full time professional musician. The repertoire includes classic Swinging Jazz Standards, and Latin Jazz styles such as the Bossa Nova and Samba. John Russell performs classic jazz solo, as part of a duo, trio, quartet or quintet. Vocals, bass, drums, piano, saxophone, trumpet can be added to suit the occasion. 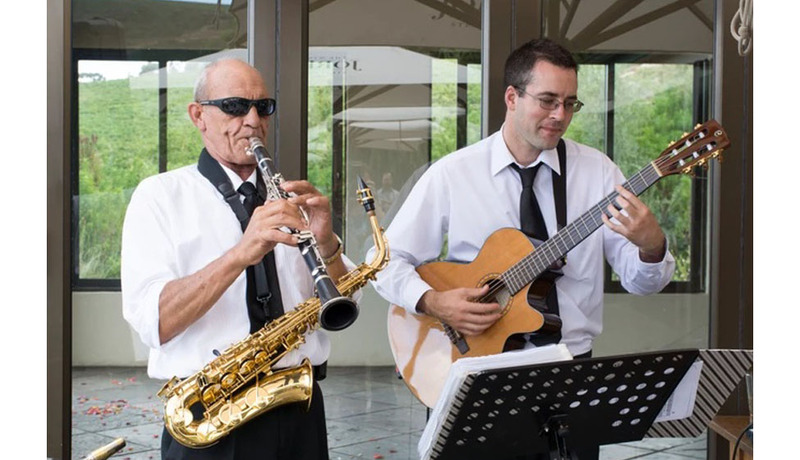 John's entertaining background music has a mellow tone to cater for your function or venue. From 2009 to 2010 the group performed in Signal Restaurant in the Cape Grace Hotel for 16 months. Other notable venues that have enjoyed their signature soothing sound include: The Commodore Hotel, The Green Dolphin, The Lanzerac, Table Bay Hotel, Cape Grace Hotel, Erinvale Estate, Diemersfontein Estate, The Radisson, The Mount Nelson, Morgenhof Estate, Nooitgedacht Estate, Blaauwklippen Vineyard, Langverwacht and others.